With his father having died in Captain America: Civil War, T'Challa (Chadwick Boseman) is the new ruler of the advanced kingdom of Wakanda. As the king, whenever a challenger for the crown announces his intentions, he must give up his Black Panther powers and take them on in a physical challenge. Meanwhile, along with his technologically savvy younger sister Shuri (Letitia Wright) and his guard Okoye (Danai Gurira), T'Challa must stop the evil Ulysses Klaue (Andy Serkis) from using vibranium to take over the world. 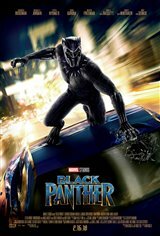 He gets help from American agent Everett K. Ross (Martin Freeman), but when a new challenger, Erik Killmonger (Michael B. Jordan), presents himself and proves he's of Wakandan background and royal blood, T'Challa must take on the new challenger.